On top of all this, bear in mind that the sandpaper and tools you use to remove flaws may actually create new (laws (middle right photo). Power sanders in particular remove wood so last that it's easy to lose control and create divots and farrows 011 an otherwise flat surface. Even hand sanding can leave scratches that will jump out at you the moment you apply the first coat of stain. Always sand in the direction of the wood grain, using increasingly finer grits, until the scratches dial are left are too fine to he seen. The reason you sand wood is to remove machine marks. All machine tools leave cuts or impressions in wood thai are highlighted by finishes—especially stains. Before machine tools were developed in the mid-nineteenth century, no sanding was needed; indeed, sandpaper didn't even exist. Wood was smoothed with hand planes and scrapers. You can still use hand planes and scrapers to smooth wood and remove mill marks. However, few woodworkers choose this route, because machine tools are much faster and easier to learn to use than hand tools. The price, however, is that sanding is tedious work. Most woodworkers use one of three hand-held power sanders to prepare wood for finishing: an orbital sander, a hell sander or a random orbit sander. Orbital sanders are the least expensive—and least efficient. They leave visible swirl patterns in the wood. These sanders usually have square pads, so they can sand inside corners. Belt sanders remove a lot of wood quickly, but they can be difficult to control. The slightest rocking of the sander will leave a gouge in the surface that will be difficult to sand out. With enough practice, however, it is possible to use a belt sander effectively. Random orbit sanders are rapidly becoming the most popular choice. They remove wood quickly, like a belt sander, but they're much easier to control, and they leave the least noticeable scratch pattern. They use round sanding discs, however, so they can't sand into corners. For the best results after sanding with any of these machines, always follow up by hand sanding in the direction of the grain with your final grit sandpaper. Sand pieces that are already joined together in stages (see "Sanding Joined Parts," at right). Wood putty rarely takes stain like wood, so special care is required to disguise it. Sanding is the answer to many wood preparation problems, but it can also cause trouble. Sanding across the grain leaves ugly scratches that are emphasized by stain. Power sanders can leave gouges and divots. 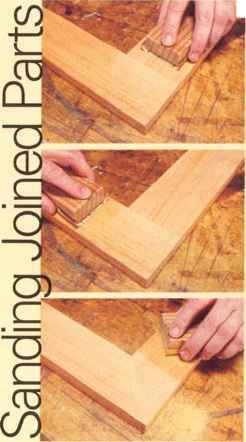 ^ Step 1: To sand parts that are joined at a 90-degree angle, start by sanding across the joint. Remove the crossover scratches by sanding the long part. Step 3: Sand across the joint on mitered parts, then remove crossover scratches by sanding to the joint with the block at a 45-degree angle. Sanding to finer grits limits a pigment stain's ability to color the wood.The sanding scratches are smaller, so there's less room for pigment to lodge. The lighter side of this board was sanded to 280-grit; the darker side to only 100-grit. The trick to efficient sanding is beginning with sandpaper that's coarse enough to cut through the flaws you want to remove with the least amount of effort, and without creating larger scratches than necessary. This holds true whether you are sanding by hand or machine. In practice, it's best to start with 80- or 100-grit sandpaper. II 80-grit doesn't remove the Haws quickly, drop back to a grit that does. On the other hand, if die flaws can be removed with liner sandpaper, such as 120-grit, you're wasting time and energy if you begin sanding with coarser sandpaper. Once the flaws are gone, remove the scratches left by the coarse-grit sandpaper by sanding with increasingly finer sandpaper until die scratches are too small to see, usually 180- or 220-grit. With some woods, such as oak. you may achieve satisfactory results sanding to only 120- or 150-grit. The goal is to produce a surface that doesn't show machine marks or sanding scratches after you apply a stain or finish. The scratch sizes make a difference in color intensity when you use a pigment slain (photo, above). Sanding is very personal. We apply different pressures, use sandpaper to different degrees of wear and sand for varying lengths of time. The only sure way to know that you have sanded enough is to apply a stain and see if any machine marks or sanding scratches show. It's wise to practice on some scrap wood until you get a feel for what works best for you. Is sanding to finer grit better? 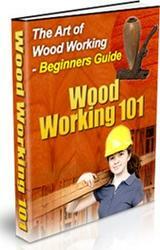 You often hear that sanding wood to 400-grit or higher produces better results. Sanding does make the wood look and feel better in its raw state. But it doesn't add anything to the appearance or feel once you have applied a finish that dries to a film on the wood's surface, such as polyurethane, lacquer, or shellac. Fine sanding does make a difference when you are applying a non-film-forming finish, such as oil or wax, but you can achieve the same smooth appearance and feel with much less work by sanding the finish between coats with 400-or 600-grit sandpaper. Wood putty doesn't take stain as wood does, so it's always better to patch flaws diat can't be sanded out with real wood. Real wood takes stain like the surrounding wood, as long as you use the same kind of wood and make sure that the grain direction is the same. However, making and filling a wooden patch requires much more work than using wood putty. Most commercial wood putties are made with wood flour (very Fine sawdust) and some type of finish that cures and binds die wood flour to itself and the wood. Homemade wood putties are typically mixtures of sawdust and glue. Since neither finish nor glue can absorb wood stain, it's simply not possible to make wood putty that will stain as naturally as wood. Ready-made colored putties are usually identified by the name of the wood they are designed to imitate and the color is usually close to that of the unstained wood. So you can often use these putties if you don't intend to stain your project. If you intend to stain, however, all bets are off as to what color putty will actually match the final color of your wood. You can color any type of putty by mixing in universal tinting colors (available at most paint or art-supply stores). 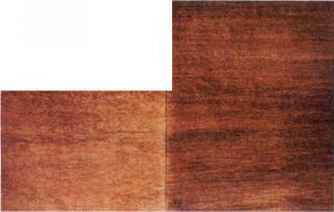 The color you want to match is that of the wood after it is stained and finished. It may take some experimentation on scrap wood to arrive at the correct color. The trick is to judge the color while die putty is still damp. At that stage you'll get a fairly good idea of how the putty will look under a finish. Take a little of the putty out of the container or tube with a putty knife (or screwdriver if the hole to be filled is small). Push the putty down in the hole or gouge, and if the depression is not very deep, smooth off the top by pulling the putty knife across the surface (top left photo, page 11). You want the putty to form a very slight mound so that it won't leave a depression when ii shrinks as it dries. If the depression is deep, it's best to apply several coats to build the putty level with the surface. Don't manipulate the putty any more than necessary; as it becomes increasingly unworkable the longer it's exposed to the air. Once the putty is thoroughly cured, sand ii level with the surrounding wood. If the surface you're working on is flat, back the sandpaper with a flat block. Smooth the surface after packing in wood putty with a putty knife. Leave the putty slightly mounded to allow for shrinkage. Coloring the putty before applying it is one way lo approximate wood, hut you can get better results by coloring the patch aftei it is dry and sanded smooth. This method allows imitating the colors in the surrounding wood more exactly. Kssentially. you paint the putty to look like wood. 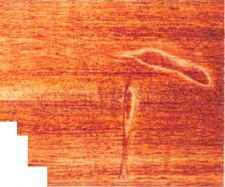 Painting in grain and figure can be done only on film finishes such as shellac, lacquer, varnish and polvurethane. Oil and oil/varnish-blend finishes are loo thin to color between coats. For the coloring medium, mix artists oil color with glaze or thinned varnish. II vou don't like the result, you can remove the color by wiping with paint thinner and try again. When you're satisfied, allow the glaze to fully cure (overnight, or longer) before you apply finish. Here's how to disguise a patch by painting in. Step 2: Paint in the grain and figure using an artist's brush (top right photo). 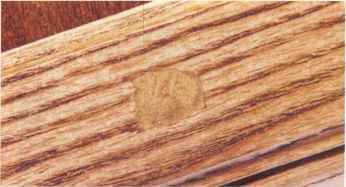 To imitate large-pored woods such as oak, vou may also want to scratch pores into the patch with the point of a knife. Step 3: One e you have a close approximation of the grain, let the patch dry and protect it with a thin coat of finish. Step 4: Apply the background color (the lightest color visible in the surrounding wood). As ail alternative, you can use colored putty dial matches the lighter color of the surrounding wood. Then add the darker grain and figure lines. One of the biggest problems you'll face in preparing wood for a stain or finish is glue getting on the wood's surface. 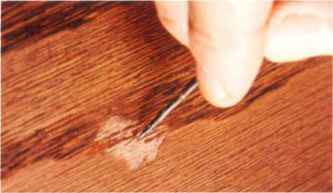 Ii happens when glue squeezes out of a joint or when you touch the wood with glue on your fingertips. Ideally; you should control the amount of glue vou put into a joint so there is just enough to produce a strong bond, bin no more. Of course, this is impossible. You work loo fast to be that exac t. So to ik- sure thai vou have enough glue in the joint, you err on the generous side. Wood isn't any single color, so it's no wonder monochromatic putty patches look bad. For the best results, take the time to color putty to math the various colors and textures surrounding it. One of the best way s to avoid glue squeeze-out is to cut cavities into the joint where the excess glue can collect. Cut mortises and dowel holes deeper than necessary, for example, and chamfer the ends of the dowels and tenons. This gives sou some leeway in how muc h glue you can apply without squeeze-out. Sometimes youi reservoirs may not be enough to hold all the excess glue. And sometimes you may actually want a bit of squeeze-out to prove that you used enough glue and have tightened the camps sufficiently (when vou join boards edge to edge, for example). In these situations, you're faced with a choice as to how to get rid of the excess. One method is to let the squeezed-out glue lack up and then peel it off. 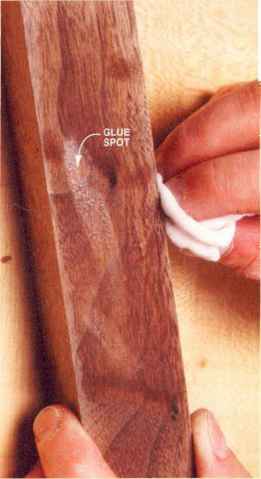 Get the peeling started by sliding a putty knife or dull chisel under the somewhat-hardened glue (photo, below). 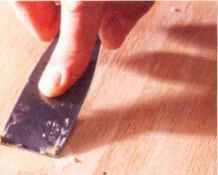 Hold the lifted glue between your fingers and lilt it away from the wood ;is you slide the puttv knife or chisel along the joint. Squeezed-out glue can also be removed with a wet cloth before it begins to set up. After the glue has hardened, you can still soften and remove it bv soaking with water, or you can sand or scrape it off. 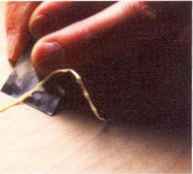 Glue squeeze-out along edge joints is seldom a problem, because you typically sand through all the glue penetration while leveling the surface. But for joints where boards meet perpendicular to each other, sanding requires extra care because of the different grain directions. Allow glue squeeze-out to partially dry. When it becomes rubbery, remove it with a putty knife. You can limit glue spots, hut some arc unavoidable. You'll have to remove all the glue from the wood surface or it will cause color problems after you apply stain and finish. Glue is easy to remove while it is still wet. Since most woodworking glues are water-based, simply wash the glue oil with water. What you are really doing is thinning the glue with the water and then removing the excess, so it's best to wash the wood several times to he sure that you have removed as much of the glue as possible from the wood's pores. There are only two ways to remove hardened glue— scrape or sand it off. or soften the glue enough so it can be scrubbed off. Scraping and sanding are pretty straightforward. You need to remove the wood to below where the glue has penetrated and then re-sand the wood to the same grit you have used elsewhere to ensure that the stain colors the wood evenly. You can soften white and yellow glues enough with water so that they can be scrubbed off. Water works better if it is hot, and best if you add a little vinegar to it. (Acids soften white and yellow glues, and vinegar is a mild acid). You will probably have to scrub a little to get the glue out of the pores. A toothbrush is often enough to get the job done, but sometimes you will need ro use a soft, brass bristled wire brush (available at paint stores). After cleaning all the glue out of the pores, sand the wood thoroughly to smooth any roughened grain. Be sure to finish sanding with the same grit sandpaper as you use on the rest of the piece, so the stain colors evenly. Other glues, such as contact cement, can often be softened or dissolved with solvents. Epoxv squeeze-out has to be sanded or scraped off. What about glue problems that don't show up until after you have applied ¿1 stain? The solution is exactly the same as if you had caught the problem before applying the stain. You still have to remove all the glue, and there are still only two ways to do this: mechanically, by sanding or scraping, or with water or a solvent. After removing the glue, you may find that the new application of stain is lighter than the original finish. This is because the stain that remained in the wood acted as a lubricant for the sandpaper, causing it to scratch less deeply. So. even though you may have re-sanded the surface to exactly the same grit as you used elsewhere, the stain colors a little less. I he easy solution to this problem is to apply more stain to the entire part (leg, stile, rail) and re-sand while the stain is still wet. Then remove the excess stain. This wet sanding will even the scratches over the entire part. If the part is then too light, wet sand again, using sandpaper with coarser grit. You'll have an easier time removing glue spots if you can see the excess glue clearly. The simples: method is to highlight the glue spots by wetting the entire surface with water or paint thinner. The liquid will soak deeper into the wood that surrounds the spot, leaving the areas that are sealed with glue a lighter color. If you use water to highlight glue spots, allow the wocd to dry and then sand it smooth again, because the water will have raised the grain. Another method of highlighting glue spots is to use glue with an ultraviolet additive, such as Titebond II Ultraviolet glue. This glue glows under black light, making it every easy to spot the smallest trace of wayward glue on your project.